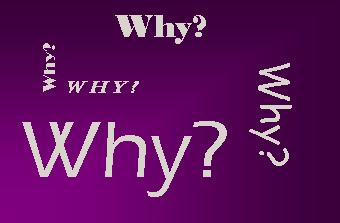 Do you have a child who constantly asks: “Why?” (We do). You might consider the constant barrage of questions tiring or even annoying (hopefully you don’t). You might consider them a challenge to your authority (and they might be). The truth is, those ‘why’ questions are important to develop critical thinking. You want to encourage the why questions, and you want to help your child to ask them more often and more effectively. Now, I know what you’re thinking, and you’re right: this could really backfire on us. But, I have a plan for that too. Good questions and the ability to ask them appropriately are the marks of a good mind. Kids who do not ask questions of their surroundings or circumstances are often following without thinking. This is precisely what we do not want out kids to do in a world that is becoming more actively hostile to the claims of Christianity. The ability to think critically is a rare skill these days. Our educational systems are no longer designed to teach this kind of thinking. Children often are taught to memorize facts, rather than to articulate and defend a position. Even if they are encouraged to articulate and defend a position, no one is allowed to win the argument. Everyone is supposed to wind up being ‘right’. No one is permitted to be wrong if they truly believe their position on a topic. No one position is considered absolutely wrong for everyone, all the time. This is particularly the case when religion is the topic. We’re just so friendly and tolerant of each other. But the problem is, we can’t all be right. For example, the Christian and the atheist have mutually exclusive claims. Either God does exist, or He doesn’t. He doesn’t exist for one person and not the other. Christianity and Judaism also make mutually exclusive truth claims, regardless of our shared moral and historical beliefs. Either Jesus was the Son of God, or He wasn’t. He certainly wasn’t both. As Christian parents in particular, the ability for our kids to learn how to identify and evaluate arguments against God’s existence or the truth of Christianity is critical. Teaching children the ability to think critically may encourage our children to ask questions about their own faith too, which I think is healthy. However, it will require you as a parent to be prepared. Happily, this isn’t too difficult given the plethora of good Christian apologetic material available in cyberspace. Is critical thinking something you’ve spent time honing in your own life? If so, how did you go about doing it? The best resource I’ve used is to develop critical thinking skills is Tactics by Greg Koukl. This post is adapted from Greg’s work. I hope you’ll check Tactics out! I’ll have some practical applications for this in my next post, including how to ensure that your child’s use of questions does not backfire against you and your authority as a parent! ← Do You Remember What You Were Worried About Last Year?